The idea to form our band in Innisfil occurred at the A.N.A.F. (Army, Navy, Air Force) Club in Barrie, Ontario on a Saturday afternoon in September, 1977, after their resident band had just finished their practice. The manager of this fairly new band approached Joe McKeown and myself and asked if we could try and get some people from Innisfil Township to join his Barrie and District Pipe & Drum Band (now disbanded). After he left us, Joe said in his stubborn Irish manner, "we will form our own band". I had had some experience in Scotland, as a fifteen year old cadet in the Cameronian Scottish Rifles, trying to learn the pipes, but like so many others, could not stay the course. I mentioned this to Joe, but he was determined and I said I would go along with him. Joe suggested that I get back to the pipes, as well as become the Equipment Manager, while he would become the Manager and also play the bass drum. Joe got in touch with Georgina Mitchell from the Scope Newspaper and told her that the band needed help. In November 1977, she announced the formation of the band and printed our Executive and our positions to the public. I then contacted Ewan Brown, a piper from Alcona, and a member of a Scout group, who came to my house and gave me lessons and I also later went to Paul McKenzie of the Newmarket Pipe Band. 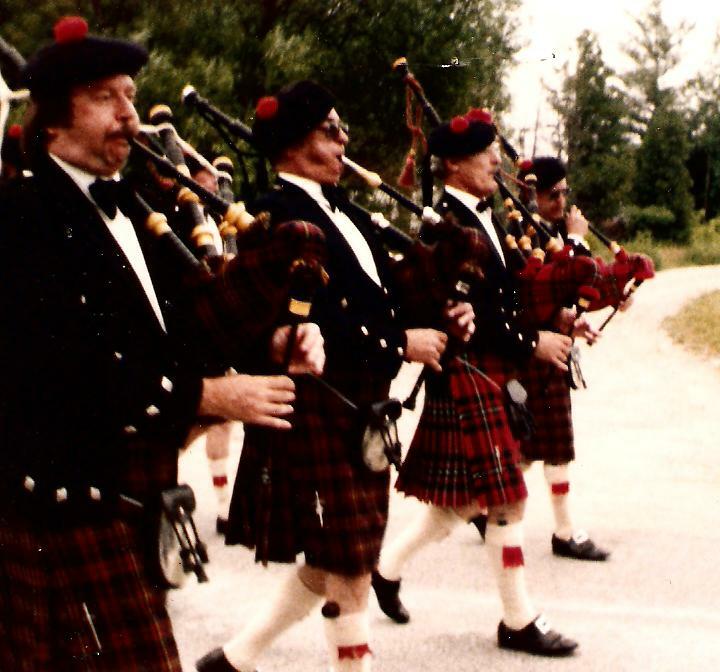 We then approached Councillor Katie Janse, who thought it a great idea, as Joe wanted to call the band Township of Innisfil Pipes & Drums. She became our champion and arranged a meeting with the full Township Council. Mayor Gibbins, Councillor Grant Andrade and the others, by an Act of Council, granted us permission to use the Township name and to use the Township crest. They also gave us use of the Old Churchill Hall, free of charge, for our practices. We asked for and received donations from private citizens and businesses in our community. We now needed a Secretary/Treasurer, so Joe asked Mrs. Jerry Robson to take the job. She agreed, and we opened a bank account in the band name and she became the third, and last, founding member of Innisfil Pipes & Drums. We visited Bill and Georgina Burnett, of Burnett's Scottish Imports in Barrie (now Burnett's & Struth Scottish Regalia Ltd.) who gave us practice chanters, pipe books, drumsticks and drum pads. Bill Burnett very kindly allowed us to pay later because Joe, who was a sewing machine mechanic, maintained Bill's machines. Legion Pipe Band with our own Joe Donald voted in as the P/M and, who was also still teaching for Innisfil. Kay Davis (right, tenor drummer) made the cake for us. Founder Rick Hillan and wife Ann look on. Innisfil's first parade (with help from Newmarket Legion Pipes & Drums) in Stroud, Ontario. Joe Donald is shown second from the left. Around this time, our Secretary/Treasurer, Mrs. Jerry Robson had to leave the band as she was going blind. Our P/M's wife, Betty Donald, had been helping Mrs. Robson, so she took over the job. Jerry died soon afterwards and we were so sorry, as she was a very gentle, good living person. Betty Donald held this position for 29 years when she too had to retire at the age of 84. Thank you Betty, for all the work you have done for us. 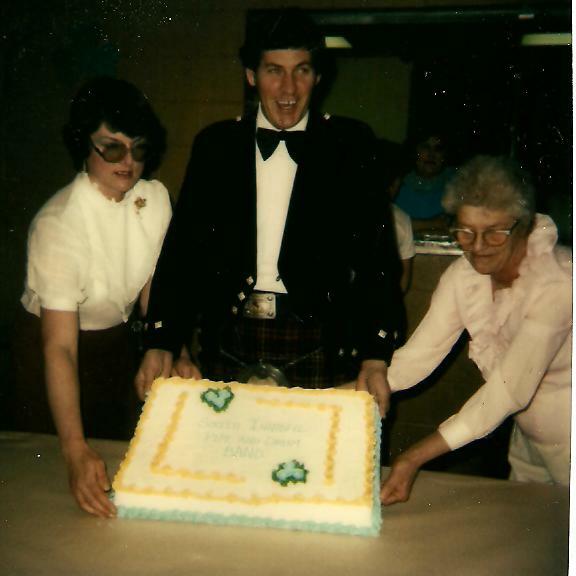 In January 1979, we held our very first Robbie Burn's Supper with Mayor Bill Gibbins, his wife Doris, me, my wife Ann, as well as Joe McKeown and his partner, sharing the head table. 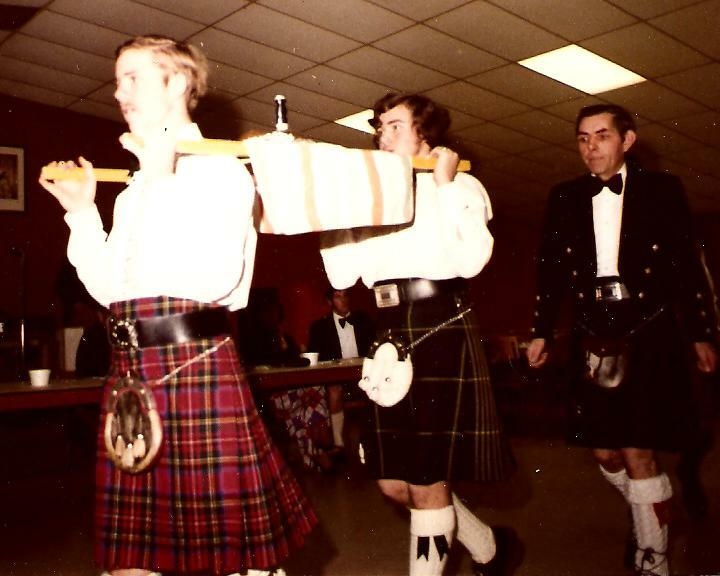 Joe Donald piped in the haggis, assisted by members of the Alcona Scout troop, some of whom later joined the band. Our band was in need of a bigger place to practice and Belle Ewart Legion Branch 547 provided this for us then and we are still there to date. On behalf of the band, I would like to extend a big thank you to the Executive, Veterans and members for all the service you have given to us. We band members had a tremendous following of lovely ladies who worked so hard, having bake sales and making things at home to sell, while giving the proceeds to the band to help us pay for much needed equipment. Thank you to all for everything you did for us, enabling us to carry on with the band. 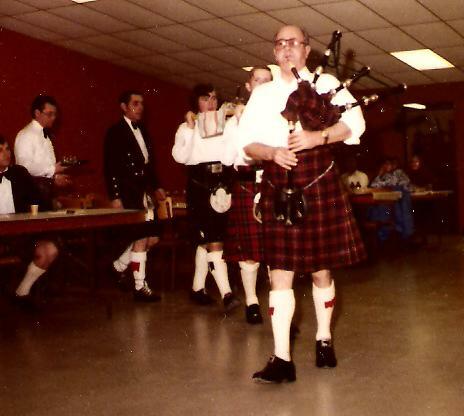 Joe Donald piping in the haggis. Two members of the Alcona Scout Group carrying in the haggis. Head Table at our first Robbie Burns Supper. Innisfil Pipe Band Ladies Auxiliary who helped make our band a success through their hard work. Sadly, in 1983, Joe Donald, our P/M, became very ill and had to retire. For a short time, Fred Tomlinson took over his job, but did not like the position, so I took over as P/M. The band really missed Joe Donald, but I started going 'round the schools, demonstrating the Great Highland Bagpipe and drew some interest. During this time, and shortly after, we had a large influx of youth, about 14 to 16 years of age...an ideal age to learn piping. Late 1980. The band is starting to pick up with steady members, including many young people. The band never looked back and very soon, with cap in hand, we again approached Bill Burnett, as we needed full-dress uniforms for our young people at a cost of well over $1,000 each plus instruments. By this time, Bill Burnett had brought a wee lassie named Margaret Struth, a kilt maker from Scotland, into the business, made her a full partner, changed the name to Burnett & Struth Scottish Regalia Ltd. and yes...they again gave us credit. Bill said he had a spare bolt of Black Stewart tartan and if we took it, he would give us a deal. Of course, we took it and Margaret made all the kilts for our young people, with a hem, because "they grow so fast". After Bill retired, Margaret became the Managing Director of the company and took full control. We owe Burnett's & Struth a tremendous thank you for all they have done for our band and the trust they showed in allowing us to pay in installments. P/M Ross Baxter, now allowed us to bring our young learning bands-people to march with the Ontario Legion Massed Pipes & Drums, in spite of opposition from other members, for as Ross said, "they will learn soon enough". Thank you Ross, this gave a tremendous boost to our band as a whole and we were gung-ho to get up there with you. 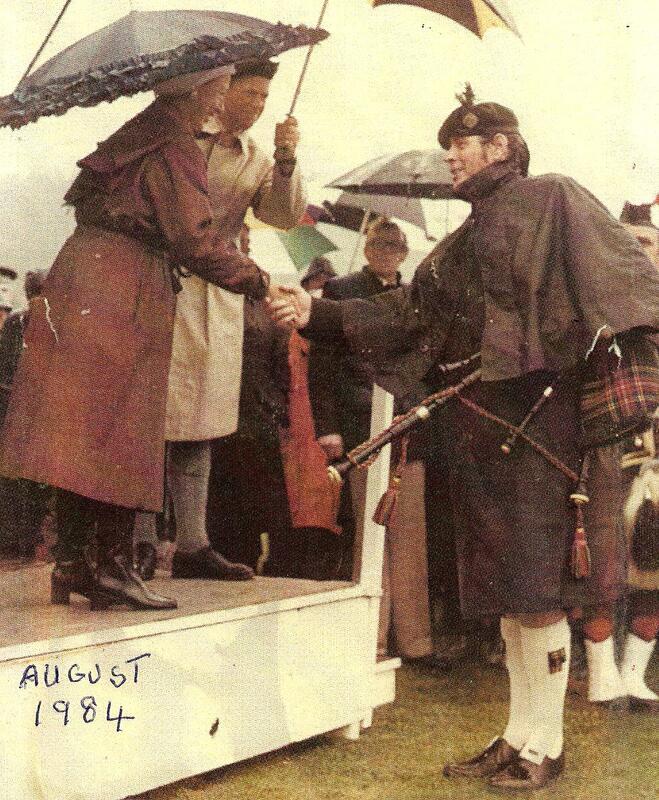 Later, in 1984, some of our members did the grand tour of Scotland with you and were at the Highland Games in Oban where we played for H.R.H, The Princess Margaret, and in the pouring rain, you introduced me to her. Thank you again Ross, you are one fine P/M. Rick Hillan (right) as P/M Innisfil Pipes & Drums, is presented to HRH The Princess Margaret. By 1983, the band had so much costly equipment, that Joe McKeown was advised to incorporate the band, as the Ontario Government might give us help with some cash money. This was handled by Fenic and McLellan of Stroud, who waived their fee for services...thank you guys. 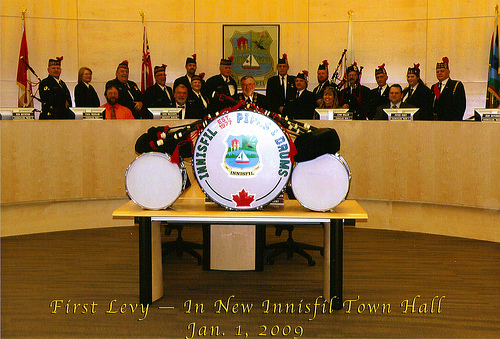 The band was now registered and incorporated as The Town of Innisfil Pipes & Drums and the band, plus all of the equipment, now belongs to the citizens of our Township. We received a grant from the Government of Ontario, which enabled us to buy kilts for our adults, who before this time had been wearing their own kilts. In 1984, Joe McKeown tendered his resignation from the band, as he wanted to retire back to Northern Ireland to be with his aged mother. 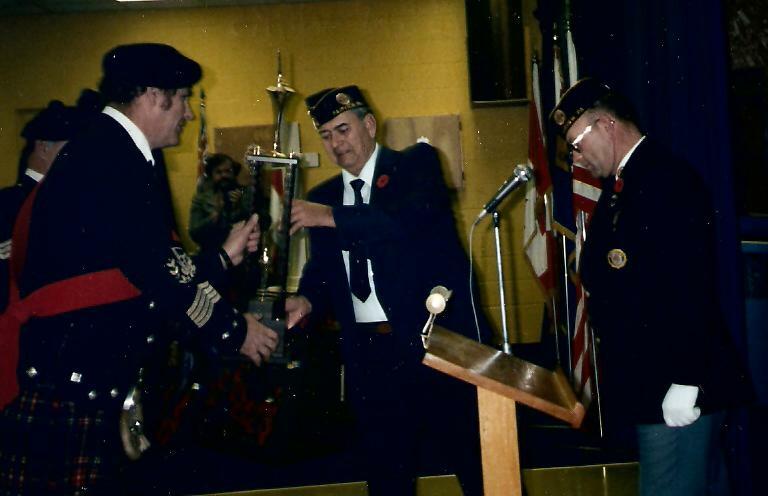 P/M Rick Hillan, on behalf of Innisfil Pipes & Drums, awarded with trophy for "Best Band on Parade" by the President of Veterans of Foreign Wars. 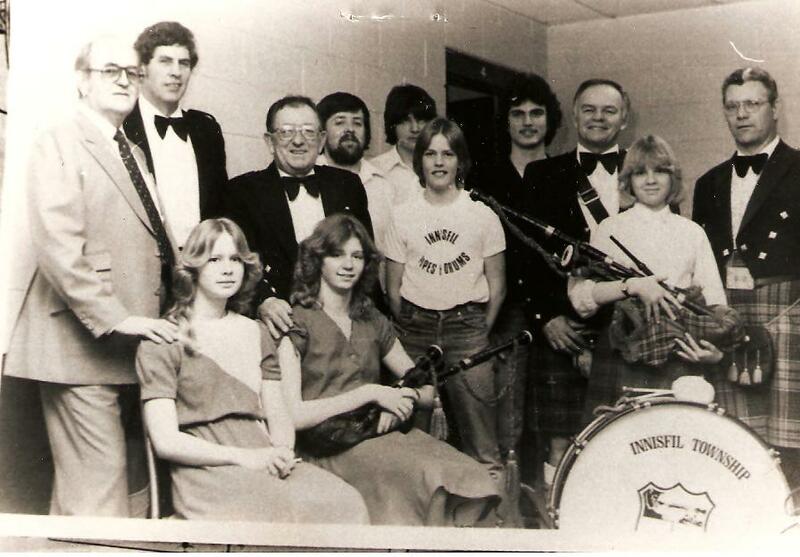 Bruce Lindsay, a schoolteacher and one of our pipers, took over as band manager for one short year, retiring on the 20th of July 1985. Sadly, also in 1985 our P/M, Joe Donald, who meantime had joined Branch 547, passed away in the Royal Victoria Hospital in Barrie. Joe Donald will never be forgotten by any of our band members or legionnaires that knew him. He was a Past-President, one in a million person and gave his all to our fledgling band by bringing not only his talent, and his teaching manner, but also the sound of the Great Highland Bagpipe music to Innisfil. Rest well, Comrade Joe. In July of 1985, Ken Wilkinson (Wilkie), our Drum Sgt, who was also a legion Past-President for two terms, took over as Band Manager; a position he still holds to this day, and is doing a great job. During the years of many resignations, and people moving, their space was admirably filled by Ken. Wilkie wears so many hats, doing so many jobs for us that never, ever, would we find enough words to convey our gratitude to him. Ken Wilkinson joined our band group on November 1979 as a drumming student and was also taught by Bill Aird, in Richmond Hill. Our present executive members are: Kenneth Hillan (P/M), Ken Wilkinson (Manager, Drum Sgt), Chris McKie (Secretary/Treasurer) and Rick Hillan (Founding Member, P/M Emeritus, Social Chairman). At this time, we have 24 members and 8 students. If I have failed to mention anyone, I apologize, as there have been so many people alive and others now passed away, who gave us their unstilted support for which we are forever grateful. I am thinking along the retirement route. Fortunately, when this happens, I know our young people will carry on doing the good work of a marching band in the community. We still need members, experienced or keen to learn, and hold our practices in the Belle Ewart Legion at 7 PM every Monday. We are forever grateful to our present mayor, Brian Jackson, and our councillors, for the Lefroy Hall for marching and for sorting out some of our problems. We do many parades in and around town for free, to help others raise funds for charity.